Ashland has been included in Midwest Living Magazine's '75 Great Small-Town Getaways." Located on the Platte River and Salt Creek, this "lazy river town" offers unique river access points and a big game collection/art gallery owned and operated by nationally known wildlife artist, Gene Roncka. Amid an influx of current growth in the area, Ashland has kept its historic charm, reflected in its architecture and homespun pride. A recent downtown improvement project has kept the original bricked street intact and added trees, cornerstones, benches and old-time light posts to the historic setting. Those visiting the area will find blend of distinctive shops featuring many one-of-a-kind treasures. Antiques, works of art, country crafts, custom jewelry, and eateries abound. Relive our nation's pride in an awesome collection of our grandest old warbirds at the SAC Museum just 2 miles from Ashland. Fly a mission in the "flight simulator," see a MIG killer bomber, and tour exhibits like the Smithsonian's Hubble's View of the Universe. But when you're ready to return from outer space and get your feet back on the ground, Ashland is also the place to see first hand, plants and animals from all around our North American continent protected at the Lee G. Simmons Conservation Park and Wildlife Safari. Drive through 360 acres of Platte River hill country and see bison, pronghorns, turkeys, pelicans, and other animals roaming throughout the park. Outdoor recreation abounds at Mahoney State Park, where year round activities include camping, fishing, horseback riding, hiking trails, golf, theater, cross-country skiing and water activities. Four streams converge near Ashland creating a terrain of hills, woodlands, farms, lakes, and river bluffs. More than 4,000 people call this area the "hills of home." Thousands of Otoe Indians were the earliest inhabitants. The Ox Bow, California and old Freighters Road crossed Salt Creek at 9th and Birch Street where is formed a low water natural limestone bridge. Ashland is ideally located half way between Omaha and Lincoln, thus offering the best of both cities and the quiet peacefulness of rural living. In the early days (1845-1848), it was the ford on Salt Creek that put Ashland on the map. "Saline Ford" was a low-water crossing on a limestone ledge -- the only one in this area. Thus, the Ox-bow (a branch of the Oregon Trail), Settlers' Road, and Military Road all came through here. As a result, tradesmen, blacksmiths, and inn keepers set up businesses to service westward-bound travelers. Before the railroads came, it is estimated that thousands of people crossed Saline Ford. The first settlers came to Ashland, and in fact, to Saunders County in August 1856. Others came in 1857 and 1858 establishing a settlement at the "old fording" of the Salt Creek. The name "Ashland" is credited to an admirer of Henry Clay who was "charmed with the natural beauty of the scenery and its seeming advantages of becoming a future city." Clay's home, Ashland, in Kentucky was thus honored. 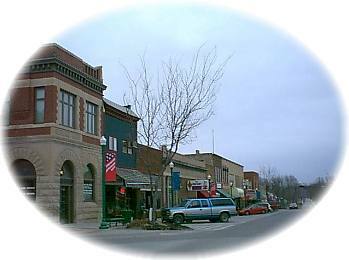 Ashland was incorporated as a city in 1870, and was chosen as the county seat. Because of its location in the far southeast corner of the county, citizens in the highly populated northern section complained about the distance to travel over muddy roads. Elections became indecisive and then came some illegal intervention! Ashland became yet another victim to have lost its claim to county records by thievery, having them hauled away in a farm wagon on a cold December night.